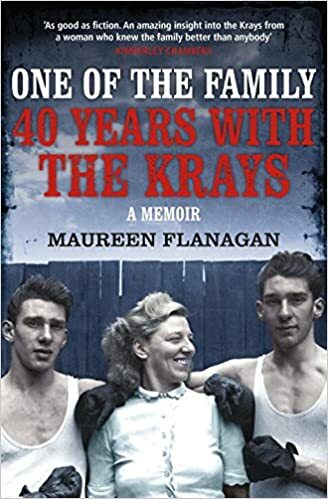 One of the Family: 40 Years with The Krays by Maureen Flanagan what an assume read, that is why there hasn’t been much happening on the blog because every spare minute I’ve been reading this book. As a fan of The Krays story as stated in my Legend review, after seeing the movie it reinspired me to see what else was out there because it had been a few years since I had read or watched anything about them. If I am honest part of the reasoning behind this was that I had thought I’d seen as much as I could about the story, we all know the facts and if I am honest most of the stuff I had read and seen towed the same line. However this book when I noticed it when searching The Krays on Amazon it had something different reading the description as it wasn’t someone that was part of the firm or someone that was involved in the criminal world, so thought why not could be interesting to see another person’s thought on the legend, myths and all. Before I get into the book in detail I would just like to say that it was for me refreshing and honest, and a really easy read. The book itself and the story focused on the relationship between Maureen and Violet Kray, and although it talks about the Twins and Charlie the concentration of the story is Violet Kray and the impact lifestyle and the outcome of the Twins activities had on their mother. This was huge for me because although it was the same information that I knew about the story, but now they truly put a personal and emotional spin on the whole thing. Maureen even manages to balance the arguments really well because although she is trying to show another side of The Krays she isn’t trying to defend their antics like other books have. She on the other toss of the coin doesn’t through them under the bus like others do, it’s just her view as a Krays insider but a shielded insider. As she put it Violet saw her as the daughter she never had and in some respect that was right by the end of the book you could see that even the Twins did see her as a sister like person in their life. The book covers how she met The Krays, that she had a stronger and better relationship with Charlie out of the brothers. The one thing you get from the book is that Violet was the complete opposite to her twins she was warm and welcoming, just wanting to mother her boys and people, she cared about that was the centre of her world and what it did to her when they went away. The way in which she over compensated for Ronnie and his illness, at the expense of Charlie and to a lesser extent Reggie. It just gave you an insight, that even Maureen could sense the fear that The Twins could inspire but after making such a good friendship with Violet and making promises she stuck by them until the end. Another aspect of the book was she touched not only what happened with The Krays, but all the major points in her own life. Some Kray books although they say it’s me and my association with The Krays, for me the book is all about the Krays. This book for me just strikes the balance, because she is telling her own story too. Overall I would give this book 9/10 it might not be for everyone, but as a fan of the story of the Krays and the world of crime you may want to catch this one. It shows how they hid things from certain people and how their activities had caused problems for the people around them. I really enjoyed the read and found it really easy going.